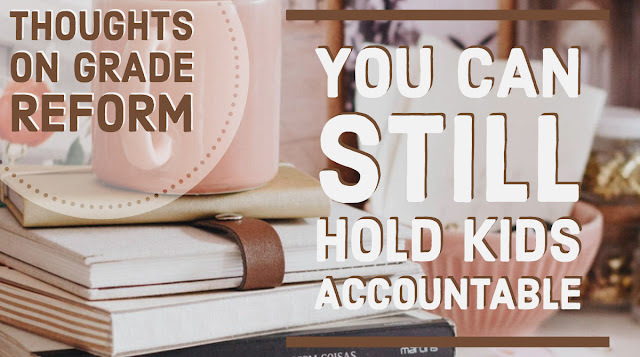 One of the biggest pushbacks I get with Standards-Based Grading is that kids need to learn responsibility and without punitive grades from late work or missing assignments they will not be held accountable to their actions. I've talked about this topic bfore when I explained why I don't grade everything but this the issue of how to create systems of accountability comes up all the time. I had a twitter conversation about it again last night so here are some of the things I have tried and some of the things to consider when working to hold students accountable in a standards-based classroom. Most of the books I have read on Grading Practices have stated that you need to collect something from every student when an assignment is due. I believe in this practice on big assignments and I find it's power lies in consistency and repetition. When it is time to turn in that assignment I ask for them all to take it out and put it on their desk, if they don't have it I give them a form to complete, if it is clearly incomplete I give them a form to complete. If you use an LMS to have them turn in work then give the forms out immediately after the turn in time for that task or assignment. The forms are about making them accountable to turn in something, they don't get to get away with not doing anything and the forms ask them to make a plan for when they will turn in the assignment as a reminder that the assignment is essential to their learning. The forms are then stored in a file for that student and become a record of their reasoning for why they haven't done the work. You can use this information when contacting home or when conferencing with the students. Will there be students who don't care and don't take the form seriously? Yes, but if a student is truly not doing any of the work and you have them fill out the form, it acts as a starting point for conversation. You have given them the opportunity to explain their why, you've asked them to be accountable for their actions if they don't take those opportunities that is on them but now you have more pieces to the puzzle of why this student chooses not to do the work. I think most teachers have that student in each of their classes that needs more help and support to get back on track than the individual teacher can give, these forms help paint a picture when we go to administration or counselors for help with a student like that. Now it's not just "I have a student who doesn't do anything, how can we help this kid?" Now you can walk into that meeting with "I have a student who doesn't do anything, here is what he has told me, how do we help this kid?" Just because you do not impact a letter grade doesn't mean there can't be consequences. If deadlines and due dates are important in your classroom then create consequences for not meeting them. The point of Standards-Based Grading is to make sure the grade is an accurate measure of what they know and can do, the point is not for it to be easier for the student but for the grade to be more accurate. When creating your consequences it is important to remember that a point penalty on late work doesn't make students finish their work on time, it makes students copy and cheat. Because of this, it is important to measure and determine appropriateness, if the consequence is too harsh and too severe then students will continue the culture of cheating. For example, in my AP Class when measuring classwork and homework combined, they are allowed 2 missing assignments at a time with no consequence (these assignments are not assessments, they are the daily work in class) but once they hit three I email home. If they have 4 or more they get an invitation to an academic intervention which is just a tutoring session during Office Hours or after school. On formative assessments and summative assessments, there is less wiggle room. If it is missing, they get an email home immediately. But these are the consequences that work for my students, yours may need something different. This is one of the areas where I truly believe there is not one perfect way to make this work for every class, instead, it depends on the students in the room. If there is really a pattern of behavior that needs to be addressed a conference can sometimes turn things around. It gives students the opportunity to explain their actions and allows you a chance to help to clarify any misunderstandings or perceptions the student may have about a grade. This is a great place to bring out the No Work forms and discuss the patterns you see but in the end, try and get the student talking more than you, you are trying to find what the issue is. I believe in taking the approach of gathering knowledge and not the approach of the conferences being punitive. I want students to see it as their time with me to express themselves more than anything. This one won't work for every student but just as you call home for negative behavior or document when things are missing remember to celebrate the awesome even more. I call and email home for outstanding work, when there is no missing work, or just because a student was kind and caring in my class that day. I don't call or email every single day but I make a point to make positive contact once a week. The easiest is through the mass email function our grade reporting system has, I'll click all who scored high on a summative assessment and tell their parents to take them out for ice cream to celebrate all the hard work they put in to earn that score. I don't give pretty points on assignments but I will shout to the world about the amazing work my students did on Twitter or Instagram. Knowing there is recognition for hard work means something to a lot of our students so sometimes when the reward they knew before is taken away (they get full credit for turning it in on time) they may not participate at the level they used to. Again, this won't work for every student. But by having systems in place to address issues of compliance and work ethic it will help the culture of your classroom. Having systems of accountability will help students see the importance of timeliness without it impacting them academically. If you've done any research on school-wide behavior and the tiers of intervention (which can both be applied academically and behaviorally) then you know that most systems that have been studied have found that a small percentage of school populations need more than the average classroom teacher can provide as an intervention. The more we as teachers can document, both through test scores and narrative data, what is happening with a student the more likely we are to get them the intervention they need. Going Standards-Based won't magically help these students, these students still need more than the average classroom can provide but going Standards-Based often makes it easier to see where the struggles really are since they are no longer masked behind 10 point worksheets and 100 point projects. Do you have a way to keep students accountable in your class? I'd love to hear about it in the comments! Thoughts On Grade Reform: What Does A Grade Measure? Teachers are at their best when they collaborate and share ideas. Not only can we learn from those who teach the same grade and content as us but we can learn as larger cross-curricular communities. I don't believe grade reform is one size fits all. I believe there are some essential conversations that need to happen regarding grading practices. One of the essential conversations I think all educators need to have more is what does a grade measure? I don't think this is a one and done conversation, I don't think that once you "reform" your practices you get to check this conversation off your to-do list and move on, I think this needs to be constantly on the radar of teachers because what a grade measures is essential to every aspect of lesson design and planning. In most public schools, grades are required, and while many colleges and universities have ways to allow for alternative grading systems, our students and parents mostly see grades through the traditional lens of being a measure of what comes next. But what do those letters mean? What are they a measure of? So much of what I used to grade was compliance: did you complete it? did you turn it in on time? did you participate in the discussion? And while none of these behaviors were anywhere in my standards that was the real grievance here: none of them were measured as individual skills. None of them were reported in a way that I allowed me to then tell a student or parent: this is where you struggle and this is where you excel. Whether you determine that Standards-Based Grading or Portfolio Grading or Reflective Grading works best for you is a whole other beast of a conversation to have but something I wish more teachers would get behind is delineating grades to show what is truly being measured. Rubrics often do this, but a rubric attached to an assignment with no conversation about it or no time to review it with students will result in students only looking at the averaged total score. A rubric on its own changes nothing, to make grades a tool of learning requires a circular pattern process of setting a goal, working towards that goal, getting feedback on where you are towards that goal, and making the changes needed to meet the goal. Often as teachers, we know what the points mean when we grade out of total points, but how often do we communicate that with students? Even in classrooms that are Standards-Based, I have seen students confused about what a grade means or what it is measuring. I know personally when you go standards-based in a school where few others are standards-based you have to work extra hard to get students to understand the process but if they don't understand how you grade how is what you are doing a tool for learning? I started this post by saying I think there are conversations that need to happen more and the one that weighs heaviest on my heart is: What does a grade measure? What does a grade mean? I don't think this has to look the same in every classroom, I personally teach English Learners and AP World History and my grade books are different based on the needs of my students, I know that it is not one size fits all. But I do think there are two big things we can all do more of to help make grades a tool for learning. 1. Delineate grades more to show what each number truly measures. And make sure to have conversations before, during, and after the assignment is done to help students understand how to meet those measures, where they are at, and where they need to improve. This step will help make grades a tool for learning. 2. Make sure students understand how you grade. As I said before, this can be particularly challenging when you implement grade reforms in a school where the majority of teachers are sticking with traditional grades but if you want grades to be a tool for learning and not just an end result, students have to understand what is being measured, when it is being measured, and how it is being measured. You have to teach them how you grade when you move to non-traditional practices, not just review the syllabus at the start of the year but actively and consistently check that they understand how you grade. Because if a student does not understand why or how they earned a B in your classroom what would make them work for an A? As I've said before, I am not personally convinced that this must look the same in every single classroom. I also think that as teachers explore these concepts it is important that we continue to discuss what works, what doesn't, what challenges we face, and create a culture of collaboration where we share resources, ideas, practices, and challenges. John Hattie's research shows that Collective Teacher Efficacy (when a school staff believes it can collectively accomplish great things for students) is the most impactful practice teachers can do right now to increase student achievement but collective teacher efficacy means we need to tear down our classroom walls and work together with a belief that the hard work will impact student achievement. 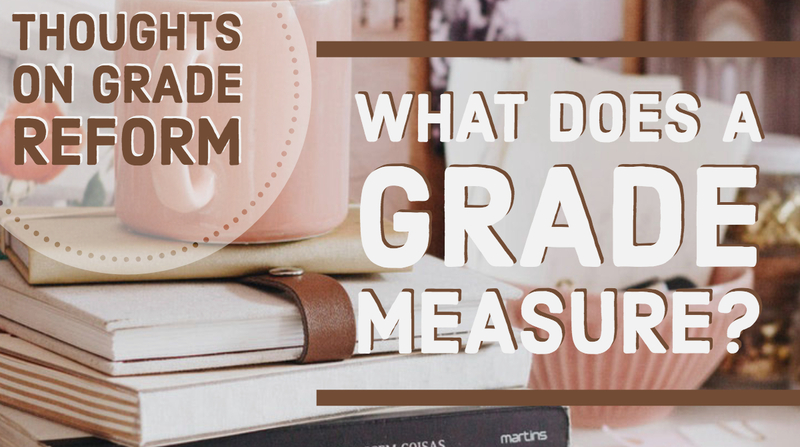 We need to put aside our egos and have tough conversations and I think one of the most important ones we need to continually come back to is: What does a grade measure? What do you think? I'd love to hear from you, share your thoughts in the comments. My classroom is not one-to-one and the devices I do have often have a lot of issues because they were small sets of devices that I was asked to pilot to see if they would be the best fit for busy classrooms like mine. Because of this I often have to take things like hyperdocs and find ways to make them work for limited device classrooms. GASP! I said that evil word that has supposedly been banned from teaching. But to be real, the easiest way to do this is to have a worksheet (yup, I still use worksheets), partner kids up, and then have them follow along on a shared device. You could use Nearpod or Peardeck (both of which are amazing tools) but if the students need to go back to the information and review it only the student logged in will get a copy of the notes they take with Nearpod or Peardeck. This where I will defend worksheets, the value of the worksheet has to do with two things: purpose and implementation. When you aren't a one-to-one school and students need access to resources to study it borders on inequitable to make all those resources digital. So while we do a lot of work online, I use an LMS, and I try and create a blended classroom, my students still have a notebook because I am preparing them for an AP Exam and they need all these notes to study in the Spring. I don't know what their device situation is at home and I don't want to depend on that when I don't have consistently reliable devices I can provide. You can see how I do this here with a lesson on Africa I modified. I did not originally create this lesson but I made it into a hyperdoc that could be self-paced or teacher driven. One of the easiest ways to add more hyperdocs in a limited device classroom is to make them smartphone friendly. This one isn't a TRUE hyperdoc, it is missing some of the key steps that a hyperdoc is supposed to have but it follows those elements of making it student self-paced and giving students choice. This one works well on cell phones as it takes them to articles to read and take notes on. Part II (making the postcards) was originally designed for one-to-one use but could easily be done on paper if needed. What makes hyperdocs SO GOOD is that they are well-designed lessons. Whether you are following the Explore-Explain-Apply model or the more in-depth Engage-Explore-Explain-Apply-Share-Reflect-Extend version, you get the key components of solid lesson design when creating hyperdocs. Part of what makes hyperdocs so amazing is that they are solid lesson design that are student-paced and incorporate student choice and student voice but sometimes we can't do ALL of those things. Sometimes the lesson needs to be teacher driven and sometimes students need limited choices to ensure a viable curriculum is covered. But the lesson design of a hyperdoc can be used with almost any type of lesson to ensure that you aren't just preaching from the front of the room but you are engaging learners and pushing them to apply their knowledge. I know I need to focus more of my lessons around how I will get students engaged, how they will explore, and then how they will apply what they have learned. And Ideally, they need to be sharing, reflecting, and extending the learning every day as well. It doesn't have to be a fancy google doc or hyperslide to be a good lesson but the elements of a hyperdoc - the steps they ask students to take can take any lesson to the next level. 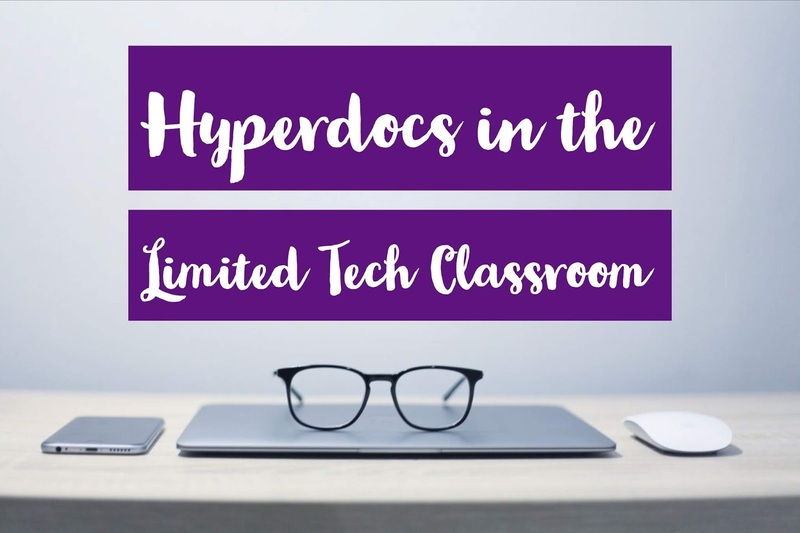 How do you use hyperdocs in the classroom? Share in the comments below.